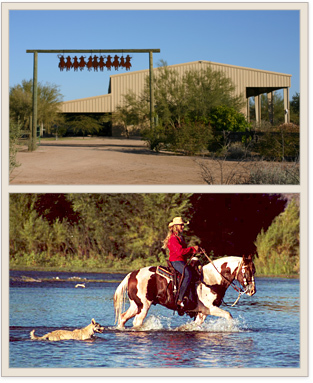 Big Sky Ranch is located in Scottsdale, Arizona just a short drive north of the Phoenix International Airport. Nestled in the rolling foothills of our beautiful Sonoran Desert right next door to the Tonto National Forest and the Superstition Mountains, we are fortunate to enjoy picturesque unlimited trail riding all year round. We strive to offer you the very best of the Missouri Foxtrotting Horse breed and are dedicated to promoting what we believe is the finest trail riding horse in the world. Our huge selection of beautiful, smoothgaited, well mannered horses for sale and our team of friendly knowledgable staff will make finding your next trail companion fun and easy. Thank you for visiting our site and always: "Happy Trails!"